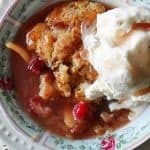 The holidays are over but if you still have apple pie filling and cranberries on hand, why not make a delicious dessert for an any night treat? Pair it with vanilla ice cream and serve warm. 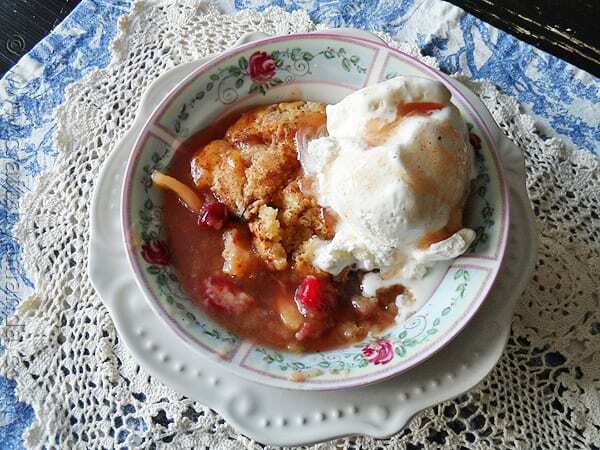 I actually made several jars of this apple pie filling a few months ago, so I used it and some of my frozen cranberries to make this delicious crisp. I based this recipe on my Pear Peach Crisp, basically just using the topping batter and water instead of can juices. This was absolutely scrumptious! 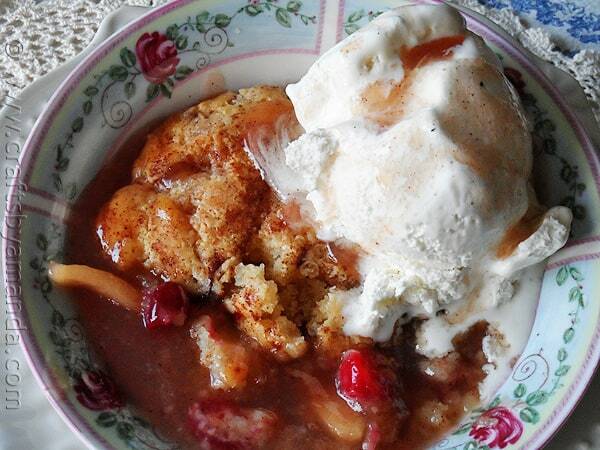 I drizzled the sauce from the apple pie filling over the ice cream, so good! RELATED: Try these delicious Stewed Pears! Doused in magical holiday flavors, these red wine stewed pears are a must for the fall/winter season! baking dish. Sprinkle cranberries on top fold in just a little to spread them around. Cream together butter and 1/4 cup of the sugar in your mixer until light and fluffy. Turn mixer down to low and add the flour, baking powder, salt and evaporated milk. Turn mixer up to medium and mix until well combined. Spread the batter over the fruit with a spoon. Whisk together remaining 3/4 cup of sugar, cornstarch, nutmeg, cinnamon and allspice. Sprinkle sugar mixture over the batter on the fruit. Heat the water in the microwave until boiling then pour over the sugar mixture in the baking pan. Bake in preheated oven 55 to 60 minutes. 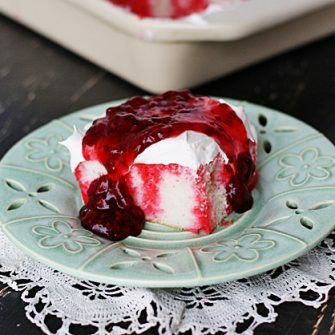 Serve with vanilla ice cream or homemade whipped cream. I love crisp in the cold winter days, and yours looks so tempting, especially with that dollop of ice-cream on top. Thanks Roxana, it’s truly delicious! i would devour the entire thing. i love a crisp anything! Yum! 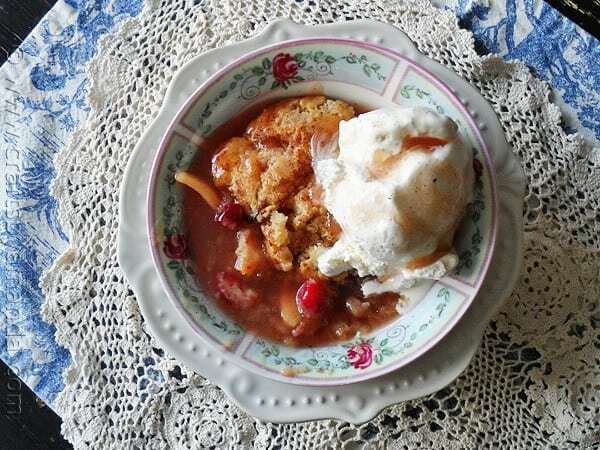 I love the addition of cranberries, perfect for transitioning the apples into winter! I love crisps! Love the apple cranberry combination! I want a big bowl! Lovely recipe….that’s an beautiful way of starting a day…..